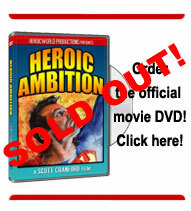 ﻿Heroic Ambition is a superhero entertainment documentary, produced by HeroicWorld Productions. This film was written and directed by Scott Cranford, founder of HeroicWorld.com and former official "Superman" of Metropolis, Illinois. Heroic Ambition uncovers the ambition of the city of Metropolis and the people surrounding the Annual Superman Celebration. Follow Heroic Ambition on IMDb! Sign up for our official email list for film news and updates!